Caption slip reads: "Photographer: Paegel. Date: 1956-05-02. Reporter: Vincent. Assignment: Missing Singer's Car. 27-28: Blood-smeared car of missing singer Maxine Owen is examined by Examiner reporter Robert O. Vincent at auto dealer (Muller Bros) where it is impounded by LAPD. 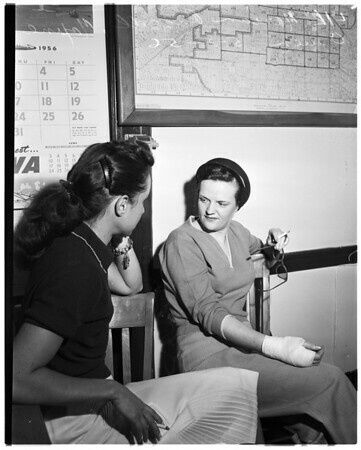 l. to r. at Hollywood Station, Marion Russell, friend, and Maxine Owen, who was thought to be missing. Shot of house at 8315 Oso Street, Canoga Park, where Maxine Owen lives".